Acoustics By Design gets requests, every week, to help corporate office environments with their speech privacy. Whether it’s a conference room, single private office, or one with legal privacy concerns (like a doctor’s or lawyer’s office), it’s important to keep certain conversations protected and private. In other words, the type of work performed in a space, and expectations of privacy, can dictate the acoustic shape of the space. Of course, you can plan for your privacy needs in advance, or handle the renovations later when you find that you need some private spaces. 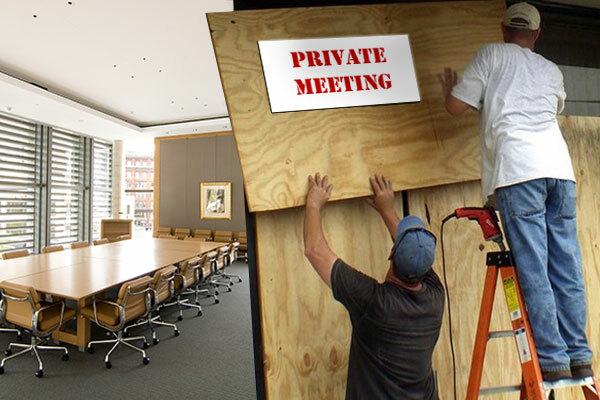 Either way, with proper planning, you don’t have to board up the Board Room to have a private conversation. The design and setting of where you work is important to your quality of life. Likewise, the quality of your work can be impacted by the same setting. The ability to have private conversations is one aspect of that quality setting. And, beyond quality, there’s necessity. Banks, doctor’s, and attorney’s offices all carry different levels of privacy expectations. The United States Department of Health and Human Services implementation of HIPAA (Health Insurance Portability and Accountability Act of 1996) has bolstered the priority on oral privacy. Speech privacy acoustics is an integral player in ensuring the success of HIPAA in protecting an individual’s personal medical information. Healthcare facilities require a higher level of confidentiality for conversations that isn’t required in a general office environment. That doesn’t mean the average office needs no speech privacy at all. Human resources, managers, and the C-suite offices in-general usually require some level of privacy. Meetings in conference rooms often contain content that must be kept confidential. As it turns out, people don’t have volume knobs, and no matter how hard we try to keep our voices down, sound travels. Popular design and construction trends lean toward the open office model. Repurposed factory buildings are sporting a variety of office types with beautiful, albeit noisy, spaces. The beam and brick construction, with low partitions and glass enclosures, admittedly looks great, but doesn’t provide privacy from one office to another. Additionally, sound often leaks above and below, as well as side to side. High levels of design improve the well-being of people in those spaces. Spaces designed for quality of life from aesthetics tend to discourage the quality of life from acoustics and speech privacy, but of course they don’t have to. Initiatives from clients and manufacturers alike have led to unique and attractive solutions. Most of what you would expect to see might be a sound-absorbing panels, as all walls are not created equal. It is important to give special attention to proper partition selection and implementation. However, absorbing plays less of a role in speech privacy than does sound-blocking, and sound-covering. More robust wall partitions and door seals designed to block sound-flanking paths are critical. When absorbing and blocking isn’t enough, the placement of a sound masking system at the site of the listener can compensate, creating a more private adjacent space. A well-tuned sound masking system can be virtually invisible, and go undetected by people in the office. When architects, designers, builders and independent acoustical consultants like Acoustics By Design work together, form and function can also work together. Materials that absorb, block, and cover sound can be part of a design that is pleasing to the eye and ear alike. Acoustics is a key member in thoughtful design of the modern work environment. Whether you add appropriate acoustics to your office environment when you’re planning it at the beginning, or if you’re responding to needs later on, Acoustics By Design is here to help provide your office with integrated design for speech privacy, and productivity. John Sandvig, LEED AP BD+C, is an Acoustical Consultant in Grand Rapids, Michigan, and a graduate of Purdue University, where he earned his Bachelor’s degree, concentrating in Acoustical Engineering and Theatre Production Design. John’s interest in acoustics stemmed from his childhood. Growing up around music, his love for sound developed by listening to unique instruments and focusing on how the sound they produced filled each performance space. When John is not at work, you might find him spending time swimming, hiking, or biking with his wife and daughter, playing the drums at his church, or tackling renovations on his house.